The 75th annual Golden Globe Awards took place at the The Beverly Hilton Hotel last night. Stars were championing the Time’s Up movement and in solidarity, stepped out in black. The movement brings attention to the recent sexual harassment allegations in Hollywood as well as shining a light on gender equality. 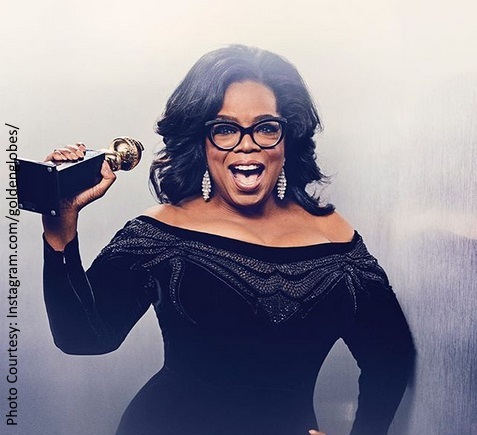 However, it was Oprah Winfrey who brought down the house with her acceptance speech as the first black woman to be honored with the Cecil B. DeMille Award. Her speech was so inspirational that she received not one or two — but three standing ovations. “What I know for sure is that speaking your truth is the most powerful tool we all have,” she said. “And I’m especially proud and inspired by all the women who have felt strong enough and empowered enough to speak up and share their personal stories. Each of us in this room are celebrated because of the stories that we tell, and this year we became the story. “But it’s not just a story affecting the entertainment industry. It’s one that transcends any culture, geography, race, religion, politics, or workplace. So I want tonight to express gratitude to all the women who have endured years of abuse and assault because they, like my mother, had children to feed and bills to pay and dreams to pursue. Three Billboards Outside Ebbing, Missouri was the big movie winner of the night, scoring four awards, including Best Picture (drama) and Best Actress (drama) for Frances McDormand’s performance. Click here to read our review. Lady Bird won Best Picture (comedy) and Saoirse Ronan won Best Actress (comedy or musical). Click here to watch our interview with Greta Gerwig, director of Lady Bird. HBO’s Big Little Lies smashed the competition by winning big on the TV side, taking home four awards, including Nicole Kidman for Best Actress, Laura Dern for Best Supporting Actress, and Alexander Skarsgård for Best Supporting Actor. The show also won Best Limited Series. Check out our visit to Monterey, where Big Little Lies was filmed. “I tonya ” are you people kidding? We chatted with Riley Keough about her Netflix film Hold the Dark. She stars alongside Alexander Skarsgård and Jeffrey Wright in this psychological thriller.